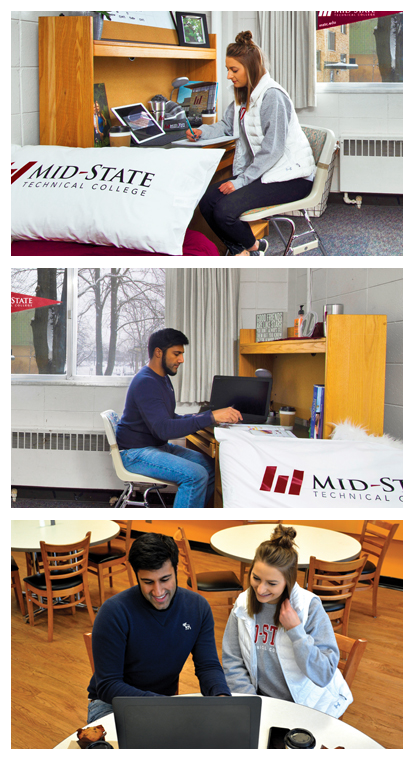 Mid-State Technical College has partnered with the University of Wisconsin-Stevens Point to provide a total college experience including dorm living in one of UW-Stevens Point’s co-ed residential halls. Live in the same residence hall (a.k.a. "dorm") with other Mid-State students, or request to room with a friend who may be attending UW-Stevens Point. Make lifelong friends and connections in a supportive environment. Includes meal plan, cable TV, internet, and residential activities and events. Transportation between UW-Stevens Point's dorms and Mid-State's Stevens Point Campus available. Cost is the same as for UW-Stevens Point students—between $3,500 and $4,000 per semester. Students accepted to Mid-State Technical College are eligible to request a housing application by filling out this form. The preferred deadline to submit housing applications is July 1 to apply for housing for the following fall semester. Applications received after July 1 will be filled on a space-available basis. Visit the Residential Living page on UW-Stevens Point’s website for more information. If you have any questions, please contact Mid-State’s dean of student support by email at Christina Lorge (715.422.5526).